This very new work originated with Sabrina’s desire to reveal the emotional element of our portraiture of Himba women – whom we met in 2008 in northern Namibia – in blown glass. She came to this decision after living with their portraits in our studios for several months upon our return from a two-month journey to South Africa, Botswana and Namibia. The culmination of three years of hands-on experimentation, trial and error, discovery and pursuit, these works embody our collaboration, cooperation, risk-taking, persistence and passion and are our homage to the seemingly omniscient women of the indigenous, nomadic Himba culture. 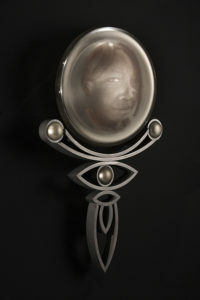 While this body of work originated a desire to integrate portraiture into blown glass, the successfully blown lenses were our narrative ‘starting point.’ For our dialog to continue with each portrait lens, we designed and fabricated three generations of wall-mounting systems, improving with each generation. 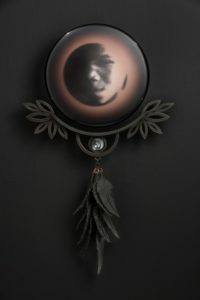 Once on our walls, we worked intuitively with each portrait lens for months, seeking clues from content and material to complete each sculpture and responding to break throughs in processes. 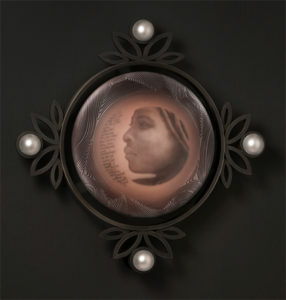 As a result, a single piece includes photography, printmaking, up to seven hot and cold glass techniques, steel fabrication and occasionally adornment with beadwork and nonferrous metals all integrated to embellish the portraits, to center and anchor them within a story.